Thursday Yard Sales, Etsy Shop & Giveaway Tease!! My BFF Beth and I are each launching an Etsy shop soon!! We will be having a tandem Grand Opening on July 8 and we will be posting pictures in our blogs soon of the items that will be going in our shops. 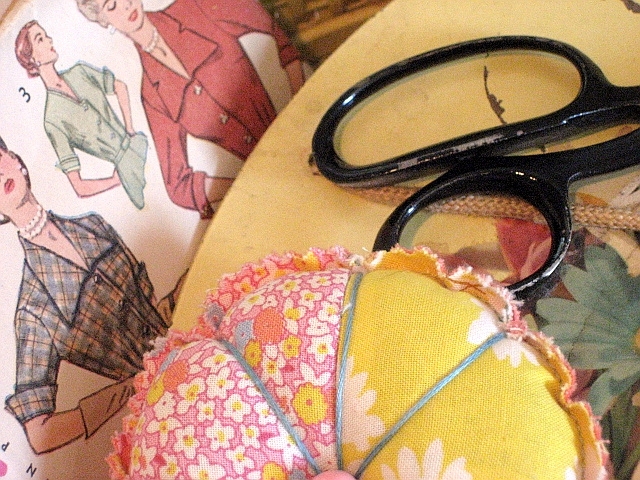 To make the opening extra special we are each hosting a Vintage Sewing Giveaway!! Mine will be pink and yellow themed and Beth’s will be green and aqua themed. On July 1 we will each post pictures of our giveaways and start taking comments to register for the giveaway on July 8, to coincide with the opening of our shops. We are both very excited! Here is a sneak peek at my giveaway. Today is also yard sale Thursday! I love it when I have the day off and there is a fabulous yard sale too! 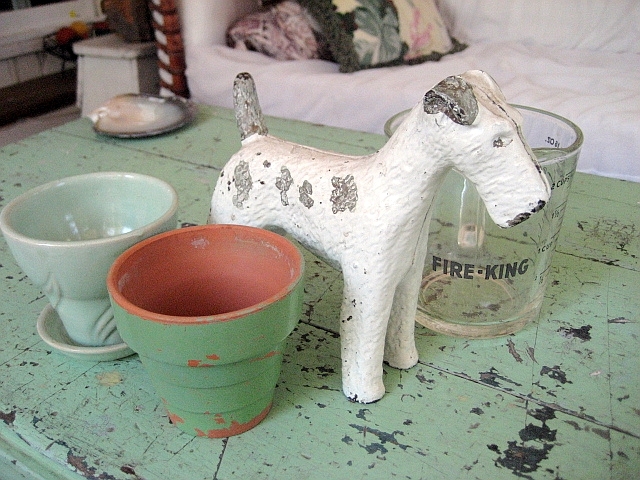 My finds today are a vintage fire king measuring cup, 2 green flower pots and the cutest cast iron fox terrier! Love the fox terrier, almost as cute as my little one, Wendy. My Tiara Swap partner, Heather should be receiving her tiara/crown today. I used a seashell/mermaid theme for my crown. It was very hard to part with! I hope that everyone will come back here and to Beth’s blog on July 1 to register for the giveaways. The sign up period will be July 1 to July 7, winners to be announced on July 8. Just found your blog through the Crown/Tiara swap. Your blog and your crown are both lovely! I am thinking about hosting a Art Doll Hat swap. If you might be interested, leave a comment at my blog. Woo Hoo! Congratulations on the new Etsy shop! And I can’t wait for the fun giveaway. Great job on the tiara. Ingenious use of those shells. I would have a hard time letting that one go too. ok…gotta go check on the other posts I’ve missed…crazy busy week! I love what you bought at the yard sales! Especially the pup, but the green flower pots are really nice, too. Your shell tiara — well, it’s just delightful. I will be adding your blog to my favorites, and trying to stop in and leave a word or two regularly. I like your energy, and enjoy the things I’ve seen so far on your blog — especially the vintage fabric! oh how fun !! cant wait to see all your stuff – good luck on the etsy i am sure it will be a huge success!! love the crown- wish i would have gotten to play but i was way too busy to do that one !! everyones crowns were so gorgeous !! 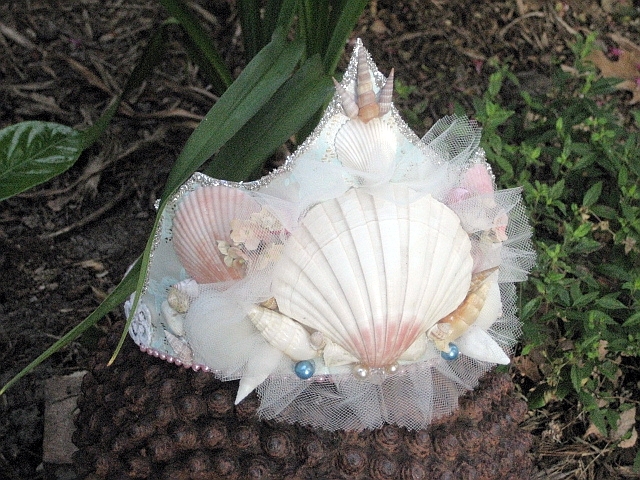 okay, I’ve seen a lot of these tiaras as I’ve been hopping lately, and I have to say that this mermaid one is a favorite – very creative theme – good luck on the etsy shop – and as for Round Top, who needs RT when you have such fantastic thrifty Thursday finds! Oh looking forward to seeing your etsy store! Love your fox terrier you found and that crown you made is so spectacular!!!! Adding you to my faves now so I can visit more often and see your beauties!!! that crown rocks! I love it. it’s one of a kind. very unusual. love it. 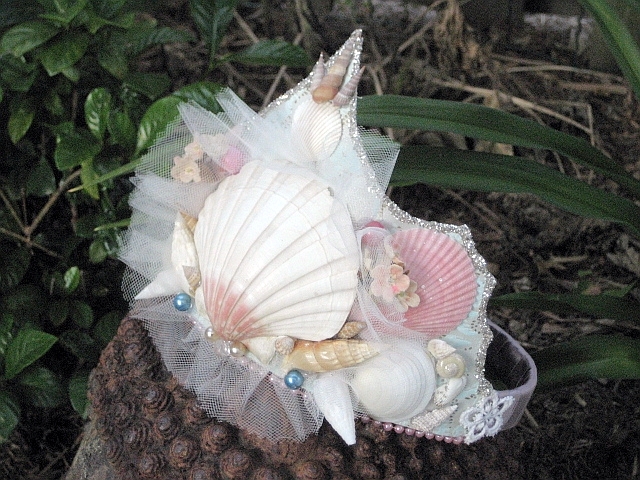 Wow, VERY pretty crown – I love the seashell theme!